I bet you know that exercise improves health, but not all the ways! Seriously, there are tons of exercise benefits that come out in all areas of your life. However, these are just the most obvious ways that exercise can improve your health. Keep them in mind as fun trivia to wow friends with. The levels of C-reactive protein (C-RP) in your blood can be correlated to the level of inflammation in the body. In several studies, people who exercised had lower levels of C-RP in their blood and, thus, correspondingly lower levels of inflammation. This was true for even moderate levels of physical exercise. Even if you're not all muscled and pumping iron, you can derive benefits from simply walking for 30 minutes several times a week. The protein C-RP's levels in the blood are also correlated to a higher risk of high blood pressure. And high blood pressure can lead to heart attacks and strokes, which defiantly fall in the not-fun category. The increased blood pressure puts more pressure on your arteries. However, regular exercise can significantly lower blood pressure (& C-RP levels), and thus decrease risk of those medical conditions. Endurance exercise is best for this. Running, swimming, biking, etc. are all great. It doesn't come in a bottle, but exercise improves health tremendously. Regular exercise, even just a 30 minute walk several times a week, can significantly boost your immune system. More exercise equals a stronger immune system. The body's NK (natural killer) cells, the ones that find and attack small cancer cells, become more numerous in the blood stream andmore aggressive as a result of exercise. The rest of the immune system gets a boost too, with more of other kinds of immune cells being produced. This time, resistance training (i.e. weight lifting, exercise machines, etc.) is the best for building stronger bones. These exercises put a lot of strain on muscles and bones. And strengthen them! For both sexes, bone calcium content is improved with exercise. The risk of osteoarthritis and fractures also goes down. With regular exercise your body's metabolism gets tons faster. That means you're burning more calories just sitting around or doing whatever - though for the best results, try aerobic exercise. Is also lowers LDL cholesterol (the bad cholesterol) as well as triglycerides in your blood. Triglycerides are a blood fat and high levels of it are associated with a higher risk of heart disease. Yea, exercise strengthens your muscles! You work your muscles harder than they've been worked before, and you get sore and stronger. 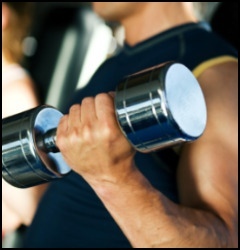 Of course, strength training exercises are the best form of exercise for strength. Weight lifting, resistance exercises, bodyweight exercises, etc. are all designed to get you stronger and work better for strength than, say, running or biking - two forms of primarily endurance exercise. Also, keep in mind that exercise strengthens the muscles that you work. Jogging will give your leg muscles more endurance, but it won't do anything for your arms. Whether fleeing the living dead or fighting deadly Japanese assassins, exercise can be very healthy. It will give you an edge in combat or fleeing. A zombie you can't avoid or kill can be very hazardous to your health. There are tons more reasons that exercise is healthy. Suffice it to say there're more than enough reasons to start working out! • Click here to leave '7 Ways Exercise Improves Health' & go back to the Complete Strength Training Home-page! 1. Fleming, Richard M., and Tom Monte. 2005. Stop Inflammation Now! : A Step-By-Step Plan to Prevent, Treat, and Reverse Inflammation--The Leading Cause of Heart Disease and Related Conditions. New York: Avery. Pp. 61-2. 2. Simon, Harvey B. 2002. The Harvard Medical School Guide to Men's Health: Lessons From The Harvard Men's Health Studies. New York: Free Press/Simon & Schuster. Pp. 130.